이 청자 음각연화문 팔각장경병은 몸통과 목을 면깍기 하여 8개의 면으로 만든 팔각병이다. 유태의 상태는 매우 우수한 편이어서 엷은 녹색을 띠는 회청색을 띠고 있다. 유층에 기포가 많고 약간 불투명하며 광택이 은은하고 차분한 느낌을 주고 있다. 몸통의 8면에는 활짝 핀 연화절지문(蓮花折枝文)을 음각하고 굽 주위에는 양각의 연판문대(蓮瓣文帶)를 둘렀다. 이 팔각병은 목의 길이가 높고 늘씬하며 둥근 몸통도 아담하고 단정하여 같은 종류의 병 가운데 가장 뛰어난 세련미를 보이고 있다. 유층의 상태와 정교하며 단정한 형태, 숙련된 문양의 시문기법이 잘 조화된 작품이다. 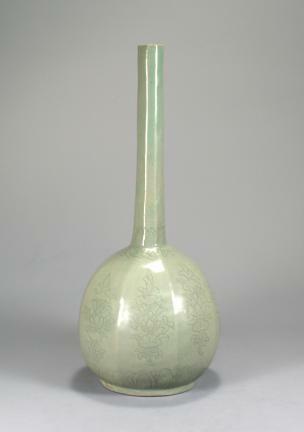 This is a long-necked celadon bottle whose body and neck are octagonal in form. The entire surface is covered in a high-quality grayish blue glaze with a slight tint of light green. The glaze is slightly opaque with a subtle luster that exhibits a serene beauty. Numerous air bubbles are trapped beneath the glaze surface. The eight surfaces of the body are embellished with incised lotus flowers in full bloom, while the area around the foot is decorated with a band of lotus petals in relief. This celadon octagonal bottle displays a refined and graceful beauty in its long, slender neck and elegant, round body, and is regarded as the finest celadon bottle of its kind. The splendid combination of fine quality glaze, elegant and graceful shape, and elaborate decorative techniques makes it an exceptional work of art.